MANILA -- Police seized Friday guns and explosives from a businessman who was seen in a security video footage involved in the mauling of two neighborhood watchmen last week. 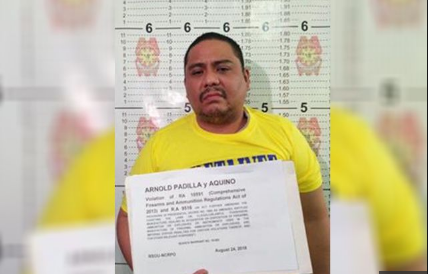 Businessman Arnold A. Padilla, 41, yielded guns and explosives during the serving of a search warrant at his residence on 18 and 23 San Antonio St., Magallanes Village, Makati City. Padilla was brought to Camp Bagong Diwa in Taguig shortly after police confiscated a Keltec automatic shotgun and a Glock 21 pistol, along with other firearm accessories. National Capital Region Police Office chief, Director Guillermo Eleazar, personally supervised the search under a warrant issued by Makati judge Elmo Alameda. PNP Firearms and Explosives Office (FEO) chief, Chief Supt. Valeriano de Leon, confirmed to newsmen that their office has revoked the firearms license issued to Padilla last April 24, after findings that the latter submitted a fake drug test result to obtain the license. The Makati police earlier filed direct assault charges against Padilla and two others in relation to a traffic incident in Makati City last Aug. 13. In a report, the Southern Police District - Makati Police said the charges were filed before the prosecutors' office against Padilla, his bodyguard Bernabe Casido alias Alberto Malijan, of Barangay 161, Caloocan City, and Glocel Razon, also a resident of Barangay Magallanes. The complaint was filed by neighborhood watchmen Carlito Mariano III and Raymundo Soliven of the Bantay Bayan of Barangay Magallanes. The two watchmen were manning traffic along the northbound side of Epifanio delos Santos Ave. (Edsa) corner Magallanes when two vehicles in a convoy ignored a red light from Gate 1 of Magallanes Village and turned right to Edsa. The complainants were prompted to stop the vehicles and accost the drivers. Police said Padilla, who was inside one of the vehicles, a Mercedes Benz with plate number GS3370, rolled down the window of his car, and had a heated altercation with Soliven. At that point, Razon and Casido alighted from their cars and mauled the watchmen.